Opting for a custom launcher is one of the fastest and easiest ways to customize your Android experience. Personalization is at the heart of Android. You’re not stuck with the same grid of app icons that came with your phone or tablet. Changing up your home screen launcher is a relatively simple method to customize the appearance and performance of your phone, and there are many good choices. It allows you to change how app icons look, where you can put widgets, and the functions and features of your home screen. Head to Settings > App > Configure apps > app permissions. Truthfully it’s far faster to just launch the settings and search for “home.” Also, keep in mind the location for this setting may vary based on your device. Pick your home app from the settings menu. From here, you can choose the launcher that shipped with your device or another you may have downloaded. You can always change back to a previous launcher from this same location. You’ll usually find the apps and layout changes you made to the home screen from any of these launchers will be just the way you remember them. Now it’s time to find a launcher. The Play Store aggregates some of the more popular choices into a section that you can access by going to Personalization > Cool app launchers. 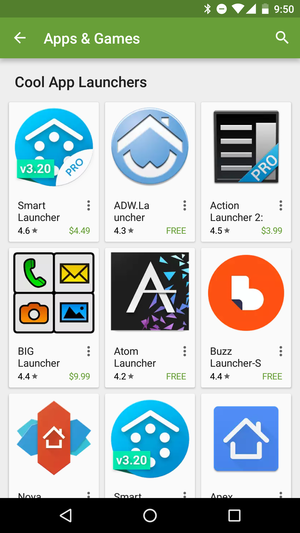 Google Play has you covered with a variety of different launchers to choose from. While the Play Store tries to use its own natural selection scheme to offer you some choices, allow us to point you to some of our favorites. My personal favorite right now is Action Launcher 3. 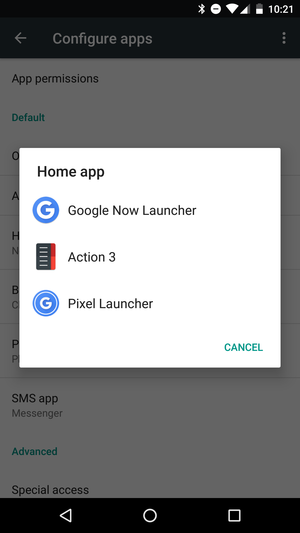 Developer Chris Lacy is constantly improving the launcher and has even added in details that align with Google’s Pixel Launcher. It’s well worth the in-app upgrade for the full version. Action Launcher 3 has a stock Android look with a lot of power tucked underneath. If you like to stick close to Google, there’s always the Google Now Launcher. However, icons look slightly large on some bigger phones and it doesn’t offer as much customization as others. Speaking of tweaks, you may also like Nova Launcher if you want to optimize your home screen to just the way you want. Additionally, Microsoft also has a good offering with its Arrow Launcher if you want one that does most of the thinking for you. Finally, once you download a new launcher you’ll be prompted to select which one to use the first time you hit the home button. You can opt to use that launcher one time only or select it as the new default.